Here in steaming Knoxville, I’m reading about medieval gardens for my next novel, set in 1190 in what is now Italy and Germany. From my study I look over the little crescent of sunny land that Maurizio and I precisely divide between beauty and color (my flowers) and sustenance and taste (his herbs and vegetables). We once had a set-to about his scraggily sage plant which had crossed over to the flower side without the aesthetic accomplishments (I thought) to earn her place. Fortunately the sage, with a little pruning, is looking well now, a soft gray-green border between art and nature. With pleasure gardens, orchards for fruit and orchards for beauty, gardens with pentices (galleries) for chess and backgammon, kitchen gardens and meditative garden paths, the medieval garden was far, far more philosophical than our little sunny crescent. 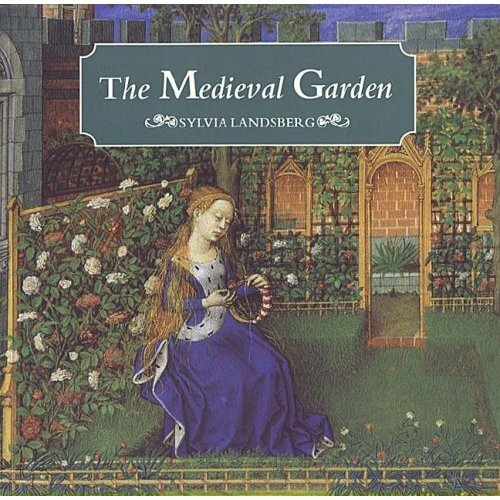 Sylvia Landsberg’s lovely The Medieval Garden includes a French illustration of a “walled pleasance” in which Nature invites the Lover to enter the garden of delight, but ah, once inside he must choose: there is a lady of fleshly love, a lady of wisdom, a lady of courtly womanhood. Lover wears a tunic that seems to be of peacock feathers and delicately holds a white mastiff dog. Which lady shall he choose? And we, with our caladium, coleus, cucumber, tomatoes, and the many hot peppers that Maurizio adores have wholly neglected the other inhabitants of so many medieval gardens, the lovely growing vertebrates. Landsberg quotes a description of a “small enclosure” tended by the nuns of Poissy: “There are antlered deer that run very fast/ There are hares and rabbits in profusion/And two fish ponds running clear,/ Well constructed, well protected with a strong wall/ And full of fish/ And there a plentiful supply of wild goats/ What more can I say? I would never be tired, winter or summer,/ Of being in that house, if God was with me,/ It is so beautiful.” A garden created by Robert of Artois in 1288 “planted” more adventurous species: lions, leopards, lynxes, camels and porcupine. Monkey puppets in cunning little frocks of badger fur were animated by strings to beckon visitors to the garden delights. Alas we have no little monkeys in badger suits.